"Breaker, breaker 1-9..this TWIC card is giving me the cannonball runs..." - A dramatization of Trucker identity dissent. 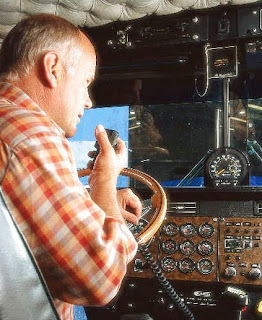 Identify that muther-Trucker with Transport Worker Identity Credential by wireless remote control? Si se puede. Codebench says they have the technology. PIVCheck Mobile enables compliance officers to verify cardholder identities and check revocation status using a wireless verification unit. PIVCheck Passage then gives the compliance officer the option to wirelessly open a door or gate using the cardholders’ Wiegand access card ID. 1000 as well as the 48-, 64-, and 75-bit FASC-N based formats. This combination of a mobile PIV/TWIC authentication appliance with wireless PACS link provides agencies with the ability to converge PIV/TWIC validation requirements with legacy access systems over dispersed operating areas. Digimarc technically has the contract with Texas for driver's licenses, through a sub contract for biometrics. Last year L-1 Identity Solutions purchased Digimarc's licensing division. What this means is now L-1 controls 95% of the U.S. state driver's license [biometrics] market. L-1 will switch to using their own biometrics when Digimarc's current contract with Texas expires. It's True. L-1 one bought Digimarc's license division in March of 2008.
Who is Mark Lerner? This guy. 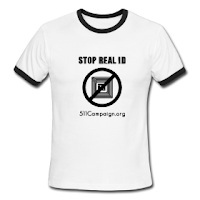 Yeah.. the Stop Real ID Coalition biometrics whistleblower guy. HEY TEXAS AND NORTH CAROLINA ... YOU'RE NEXT!! 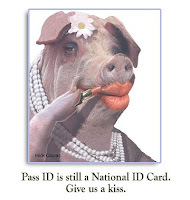 The Virginia House and Senate have overwhelmingly passed legislation rejecting elements of the federal government’s Real ID law, which requires states to issue federally mandated drivers’ licenses or similar forms of identification that would become part of a national database. The House approved Del. Robert Marshall’s, R-Prince William, bill 88-10 on Tuesday, and the Senate passed legislation from Ken Cuccinelli, R-Fairfax, 30-9. Critics of the program argue that the law is an invasion of privacy. “There’s [absolutely] no reason that we should link our data to another database that’s going to be broken into,” said Mike Stallenwerk, chairman of the Fairfax County Privacy Council. “That’s happened time and time again. The Virginia law, if signed by Gov. Tim Kaine, would not overtly reject Real ID. Rather, it would prohibit the state from complying with any element of the act that would compromise economic privacy, such as residents’ tax returns, financial transactions and investment transactions, or the security of biometric data, like fingerprints, retinal scans and DNA samples. “This is not only a very important step forward for privacy rights in the state, but it looks as if Virginia will soon join 21 other states that have expressed opposition to some aspects of the federal Real ID law,” said Kent Willis, executive director of the American Civil Liberties Union’s Virginia chapter. Congress passed the Real ID Act in 2005 in response to the 9/11 Commission’s recommendation that the U.S. improve its system for issuing ID documents. “I’d like to see them repeal it straightway,” Cuccinelli said. The program, whose purpose is to make it more difficult for terrorists to obtain fraudulent state-issued identification, is run by the Department of Homeland Security. Calls and e-mails placed to the agency were not immediately returned Wednesday.